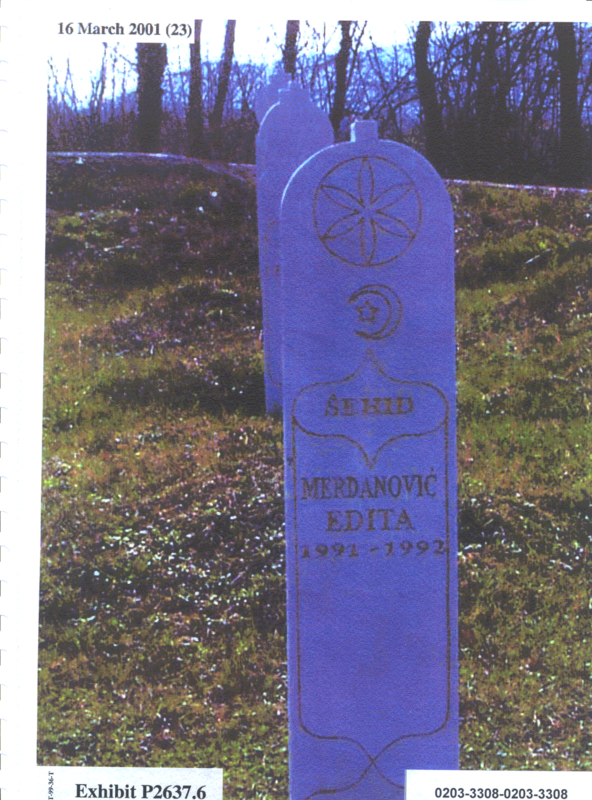 PHOTO: Bosniak baby girl EDITA MERDANOVIC killed by Serbs in the 1992 Biljani massacre (Bosnian Genocide), during the Genocide in Ključ. Former Serb leaders Radovan Karadzic and Ratko Mladic are on trial for genocide in the municipality of Ključ and several other municipalities including Srebrenica. "Over the next several days, the Chetniks went out on a killing spree in Biljani and the surrounding villages. Between 7 p.m. and 9 p.m., from their hide-outs, the rest of the Bosniaks watched the bulldozers removing the dead bodies. They could roughly tell where the bodies were taken by the time that elapsed between the journeys. The bulldozer would disappear out of sight somewhere in the woods where the bodies (about 1,500 of them) had been thrown into common graves…"
The translation of the following text into English is a courtesy of the International Criminal Tribunal for the Former Yugoslavia. The text originally appeared in Bosnian “Ljiljan” newspaper under the title “Torching of Mosque in Biljani” on 11 October 1995 shortly after Ključ was liberated from the Serbian occupation. Former Serb leader Radovan Karadzic and General Ratko Mladic are currently on trial charged with the Bosnian Genocide in connection with genocide they committed in Bratunac, Foča, Ključ, Kotor Varoš, Prijedor, Sanski Most, Vlasenica, Zvornik and Srebrenica. Poignant testimony of Naila Malkoc Dzaferagic about the crimes committed by the “Chetniks” in the Ključ region. “On 9 July 1992, I was supposed to go to Biljani to visit my family and rescue my sister’s daughter Azra (17). My daughters-in-law Sena and Subha Jeginovic were supposed to go with me, but my husband and my brother did not allow me to go. Azra had written permission from the Chetniks to leave the village, but the good Allah did not want me to go and so, just like many others, Azra and the rest of the family, were killed the following day…” This is how Naila Malkoc, nee Dzaferagic, from Biljani near Ključ, on the verge of tears, began her distressing account of the unprecedented crimes committed by Chetniks, their former neighbours, in Biljani and the villages surrounding Ključ. It is a story without end. The police chief in Sanica was Milan Tomic, who used to go to secondary school with Naila’s brother, Nail Dzaferagic. The two served in the former JNA (Yugoslav Peoples Army) together in Titovo Uzice. Milan knew every single Bosniak from Ključ. During those first days of the aggression, the Serbs told Bosniaks not to go anywhere and that no one would harm them. Milan was soon to become one of the first architects and active participants in the genocide. Ratko Radovanovic, Naila’s next-door neighbour in Ključ, personally brought and distributed weapons among the Serbs. Milenko Macanovic was a “Vojvoda” [leader of Chetniks] in Ključ. Suddenly, all the Serbs acted as if they no longer knew their neighbours. The Serbs reckoned everything would be over soon and that the Muslims would be executed and that nobody was going to find out, but fortunately there is someone who witnessed the crimes and identified criminals. “On 10 July, at 4 a.m., all Bosniaks from the surrounding villages, namely Domazeti, Mujezinovici, Mesani, Cehici, Dzaferagici, Osmanovici, Subasici, Jabukovac, Naplavak, Botornjici, Crnalici and others, having previously performed Sabah Namaz, were brought in front of the Hamdija Mujezinovic primary school in Biljani. My late father Mehmed bade farewell to the others and said: ‘They are going to kill us all.’ Those who accidentally survivded know that very well. The Chetniks first forced al lthe men out of the houses and then the women, children, the elderly and the sick. Subha and Sena Jeginovic saw the Chetniks torching the houses all the way from Mesani, forcing people out of the houses and killing them. Sena’s relatives, all members of the Mujezinovic family – brother Hamdija and his children and Ismail, son of Hasib Mujezinovic – were killed. Ismail was chopped up into pieces by Chetnik n eighbours from Samardzije. Later, his mother and sister collected the pieces of his body in a blanket and buried him near the house. The Chetnik painter Slobodan Lakic, and all other members of the Lakic and Samardzija families were particularly ‘active’ in committing the crimes that morning. The Grubisi were a little bit more ‘gentle’, said Naila. It took no less than two hours for the Chetniks to write down the names and the surnames of all Bosniaks who had been forced to go in front of the primary school in Biljani. “They put younger men in one room and the older men in another. First they segregated the younger ones and told them that they were going to participate in some negotiations and that they should take their diplomas with them. Those were the younger, more educated and healthier members of the Bosniak population in this region. One hundred and ten of them were killed together in one place near the school. One young man whose last name is Avdic and whose first name I do not know survived the massacre. He is from Brkici and he is currently in the 17th Krajina Brigade, Vitez. They [Chetniks] drove women like cattle in front of the house of the teacher Beba Grubis from Montenegro who was an accomplice in the crimes. The damn woman used to teach me as well. Her husband Bosko was no different. It seemed that Marko Samardzija, a friend of my family was, more or less, the main orchestration of the genocide. Although it was raining, all the women were turned toward Beba’s house with three fingers raised. At that same time, they were taking away the men: Smail Avdic and the others, all members of the Mujezinovic family, my uncle Smail Zukanovic and his son Hazim, the teacher Hajrudin Mesan and his son who was in the third year at the Faculty for Electrical Engineering, the other members of the Mesani, Dzaferagic, Botonjic, Domazet and other families from Crnalici and they killed every one of them… and my cousin Zejna saw all of that. She knows. My brother Semso was found in a stable, while all of the others were in front of the school where they were killed systematically. One Chetnik wanted to kill my brother and another one said: ‘Do not kill him, take him down there.’ The Chetnik Sladojevic from Slatke called ‘Krv’ (Blood) came to the door of my house and bluntly said: ‘This tractor has to be mine!’ On the road to the mosque, near Nail Avdic’s house, on the way to the village of Lakici, they killed a large number of Bosniaks,” Naila Malkoc told us this in tears. The mothers recognised their dead sons and husbands. Sadika Botonjic identified her son from his footwear… Ifeta, the wife of Hamdija Dzaferagic, went through the village and tried to count the dead, but did not succeed. The Chetniks covered the dead with branches and ten days later, they put blankets over the bodies. Several Chetniks came to the mosque in Biljani, torched it and ordered the elderly men to gather the burning rubble in their hands and sing: ‘Ko to laze, ko to kaze…’ [Who is saying, who is lying that Serbia is small...] The Chetnik Slobodan Lakic, from Lakici, was in charge of that. They killed them and torched them there. Then they headed towards the house of Naila’s father Mehmed (81 years old). Paralysed with fear, members of Naila’s family watched this happening from their house. As they were making their way towards the house, the Chetniks were killing everyone. “Apart from my father, his brother Nail, his sister Lejla (54), her daughter Azra (17), his daughter-in-law Besima (27) and her two young children Amila (four and a half months old) and Almir (three and a half years old) were also in the house… at the same time, the Chetniks, may God punish them, killed their daughter-in-law’s brother and the rest of the Avdic family from Brkici, Fiko and Osman… I cannot even speak now, my dear child…” said Naila Malkoc choking up in tears. At 2 p.m., Chetniks entered the house of Mehmed Dzaferagic and told the members of the household that they had to kill them, since they had seen too much. They acted on their word and killed them. According to some of the survivors, the Chetniks buried the victims there. Behind Dzaferagic’s house the bodies of about 15 dead Bosniaks laid one next to the other… and even the grass was burned where they had fallen. Dzevdo and Mustafa Dzaferagic watched the killing of Muslims from a nearby corn-field. Senad Avdic, Ajza’s son, whose brother-in-law was killed in his house, jumped out of the window and found shelter in the house of Naila’s father. Senad is not in the BH Army. “They also burned Smail Botonjic’s wife who was holding a baby in her arms while her other child, a girl, was standing next to her. They gave her the order: ‘Throw down the baby!’ She threw down the baby and then they killed her. They forced 17 people into a stable and torched it. The fire burned for a long time. They killed my cousins: Abid and Almaz Botonjic, the only son of Judge Dzemo. The child had not even completed the eighth grade. They snatched him from his mother’s embrace… they killed Ajsa’s son Saud. In Vojici, the village between Ključ and Biljanic, they killed 36 people in one place. They killed everyone they found there… the bodies remained there unburied for quote a long time. Aco Cepic, a son of Cedo, used a bulldozer to cover the bodies with animal carcasses from Ključ. The Chetnik Aco was so sick that he vomited while he was doing that. In Sanica, they first raped a 60 year-old woman and then a young one who helped her daughter to escape through the window…”, Naila Malkoc continued her story in fits and starts. “My cousin Hamo Dzaferagic was among those rare ones who returned from Manjaca. A few days after his return, he passed away. Cedo Ancic killed one of the Muslims from Biljani with a bottle in Batkovic. In Manjaca, Mirso Draganovic, a brother of my sister-in-law, was repeatedly stabbed in the legs with a knife. The elderly were killed right away in the school in Kljuc. A father of my sister-in-law Besima, Resid Draganovic, was among them. Over a hundred people were killed in the school. Radomic Kukolj, teacher in the primary school and a newcomer from Montenegro was a notorious criminal. A certain ‘Gagi’, a son of Pero Bajic, torched and killed all around Ključ and particularly in the surrounding villages. The Chetniks were literally competing with each other over who was going to kill more people. When they got drunk they would say who they had killed,” said Naila Malkoc, as she continued her story without end. Today they can return. They have everything they need an dthey can hardly wait to arrange for a decent burial of their dead and to find the perpetrators, identify them and let them be brought to justice by the surviving members of the annihilated families from Biljani and other villages in the Ključ region as well the town of Ključ itself… The mass graves have been discovered, the truth has come out and the deeds shall be remembered forever. GEN. DIVJAK: "DEATH TO SERBIAN CHETNIKS!"